For many people, there is nothing quite like the comfort of an electric blanket on a frigid winter night. If you hate the feeling of sliding into icy sheets at night, then you probably know the pleasure of flipping a switch and allowing your electric blanket to prepare a cozy spot for a night of good rest. But, are electric blankets really safe? Most of the time the answer is yes, electric blankets are a safe way to add a little extra comfort to your life. However, every years, for more than a few sound asleep and unsuspecting families using electric blankets, the at question is answered by the screams of FIRE when they awake in a bed of flames. Despite their track record of being blamed for causing literally thousands of home fires and dozens of deaths horrific burn injuries, most people are unaware of the danger posed by these products. However, a search of the internet for news of electric blanket caused fires will reveal a surprising number of print and video news stories reporting house fires and deaths caused by what the fire investigator determined to be an electric blanket. The fact is, there are fire risks in using an electric blanket. In fact, most electric blankets contain a safety circuit the sole and exclusive purpose of which is to try to prevent a fire when one of the known and expected fire-causing failure modes occurs in the product. What Causes Electric Blanket Fires? Simply put, there are two major causes of electric blanket fires. 2. Electric arcing of a broken electrical conductor, igniting combustible materials. However, in certain makes and models of electric blankets there may be a third cause of a fire. 3. Overheating of an electrical component of the product, other than the heating element, to the point of igniting combustible materials. With modern electric blankets the fires usually occur with no abuse or misuse of the product by the consumer, while using it according to its instructions. The fires occur with no warning, often after years of trouble free use. Sleep on top of it or curl up with it in a chair or a couch. However that was not always the case. Some of these now permissible uses of an electric blanket were the subject of warnings and potential fire danger in older style blankets. But how it the consumer to know one blanket from another? Often they cannot. 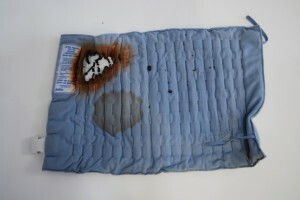 In a most modern electric blankets, even misuse or abuse of the product SHOULD not result in a fire, IF the safety circuitry included in the product functions as it is designed and intended to. The problem is, what if the safety circuit does not work as designed and intended? As the U.S. Patent States: “If …….. a fire will occur.” Unfortunately all too often, thousands of times over the years, the safety circuit does not do it job, and a fire occurs. If you have one of those older blankets, there is the potential for a fires caused by merely by bunching it up, tucking it in, or covering it. All of these uses are permissible in a newer model. Call us today at (720) 420-9800, or send an email to see how an expert product liability and personal injury lawyer can help you get the money you deserve to pay for the losses and damage you have suffered.